Grilling fish can be a little intimidating. Fish is delicate and lean which means it has a tendency to fall apart and stick to the grates of your grill. Once you get the hang of it though, grilling fish is easy, fast and delicious which makes it a popular dinner item at my house. The keys to successfully grilling fish are to make sure your grill is very hot and don’t turn the fish until it’s ready. Prepare your grill for direct cooking over high heat. Brush the fish with a light coat of olive oil and season with salt and pepper. Make sure the grates and clean and place the fish on the grill. 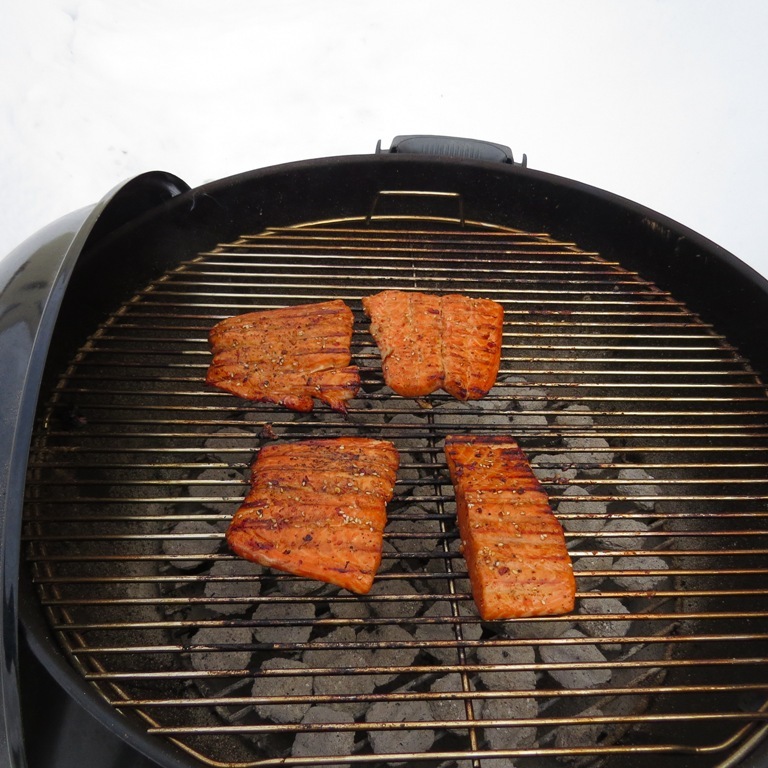 If your fish has skin, such as salmon, place the fish on the grates skin side up. I like to leave the fish on the grill until it’s about 70% cooked before flipping it over. This helps make sure you have great grill marks and the fish will easily release from the grates without breaking apart. I’m an equal opportunity griller when it comes to choosing between gas and charcoal grills. However, when grilling fish, I really like the way the charcoal flavor compliments the fish. One of my favorite recipes is Spicy Sesame Salmon. The marinade is from the Weber website and originally was used for chicken wings but I love it on salmon filets, too. Combine marinade ingredients in a medium bowl and mix thoroughly. Place salmon in a shallow baking dish, pour marinade over the salmon and let marinate for 30-60 minutes, turning salmon once. Remove salmon from marinade and blot gently with paper towels to remove excess marinade. Generously brush the salmon with oil and season evenly with salt and pepper. Grill the salmon, flesh side down first, over direct high heat, with the lid closed as much as possible, until you can lift the fillets with tongs off the grate without sticking, 6 to 8 minutes. Slide a spatula between the skin and flesh, and transfer the fillets to serving plates. Bourbon Maple Bacon "Burnt Ends"